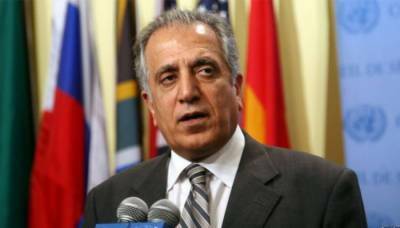 Kabul (Web Desk): Zalmay Khalilzad, who was named by President Donald Trump’s administration to find a way out of Afghan war, has shared details of his latest round of talks with the Taliban in Qatar with President Ashraf Ghani and other government officials in Kabul, a statement from the president’s office said Monday. The statement quoted Zalmay Khalilzad as saying that he had discussed a cease-fire deal with the Taliban but that there was no progress so far on the issue. Khalilzad did not confirm the statement and there was no immediate comment from the US Embassy. During the meeting with Ghani, Khalilzad rejected media reports claiming he and the Taliban discussed the formation of an interim administration in Afghanistan, said the statement. It added that Khalilzad has no authority to discuss such issues but that his goal is to facilitate an intra-Afghan dialogue — meaning direct talks between the Taliban and Kabul. The statements also said Ghani thanked Khalilzad for his efforts and praised US endeavors to restart negotiations between the Afghan government and the Taliban.